Manage a miniature stock farm on a single screen. No obnoxious dashing all over the place on errands. 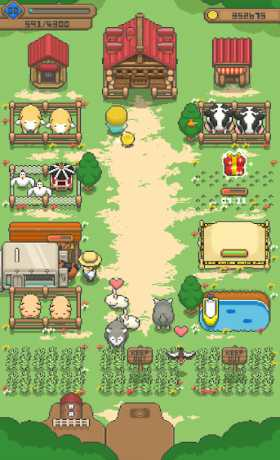 Run your very own ranch filled with a jumble of little characters bustling around. Take the weed-ridden, out of commission ranch you inherit from your grandfather and turn it back into the lively farm it used to be with lots of animals and guests. 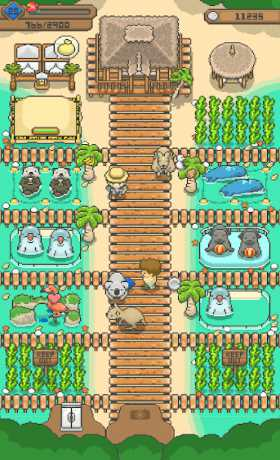 Clean up an animal area and populate it with the animals of your choice. There are different facilities for different types—sheep, cows, pigs, and more. Design a ranch rich in diversity. Once you get some life back into your ranch, wild animals such as wolves, foxes, and rabbits may show up. Increase your friendship level and get them all. Your ranch has overnight accomodations. Depending on what animals and facilities your ranch has, different guests will come to stay. Level up your guest rooms and attract them all. You sell everything from livestock to animal products here. Customers will periodically stop by to make purchases. Level up your store to get more customers and earn coins faster. 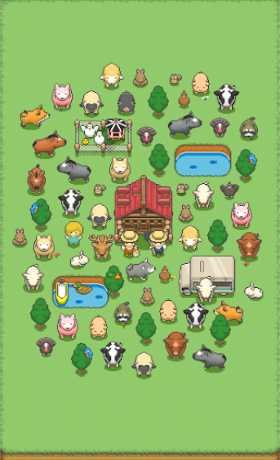 Lists your farm animals, wild animals, guests, and fish. Collect all the characters! You can hire six ranch hands and assign them to the guest rooms, animal areas, and silo. As they level up, they learn to help with more jobs such as harvesting, cutting grass, and collecting room fees from the guests. Station them where you like and leave the work up to them.